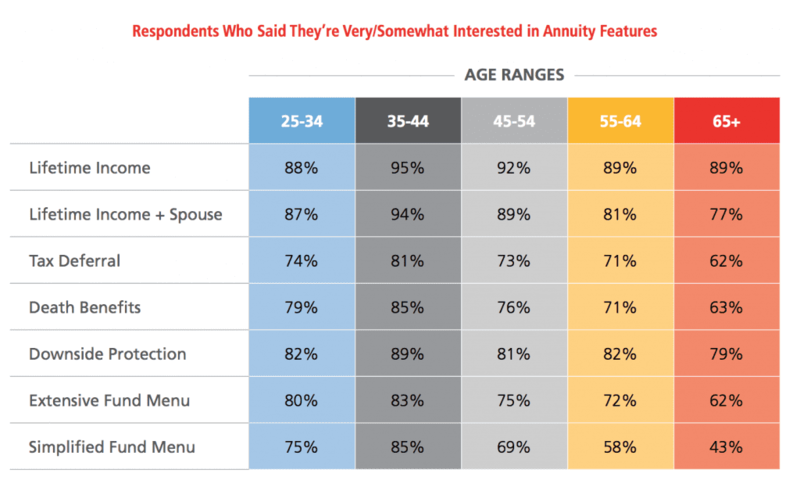 What drives annuity buyers? I mean with all the negative press about the evils of annuities, what on earth possesses these people to actually pull the trigger and purchase an annuity? Let's not forget all of the other options available to Americans. It seems despite the negativity and the plethora of alternatives, people still opt to open up annuities or continue flexible premium payments to the contracts that allow them. At their core, annuities take sums of money and turn them into income…guaranteed income…for people. They also provide safety of principle backed by financial institutions with impeccable balance sheets and ability to generate income–both investment and operational. Let's not also forget that the life insurance industry's (the major category under which annuities fall) reputation for safety and unparalleled capitalization. We can argue as much as we want about your ability to accomplish the same thing an annuity does all on your own and without the fees the insurance company charges for the annuity, the truth is most people won't do what is necessary to replicate an annuity on their own. Americans struggle with the notion of converting savings into income. It's a cryptic subject for most and annuities shine a bright light of hope and clarity straight through it. Setting my personal beliefs aside for a moment, others have shown that your absolute need to own an annuity doesn't exist. Back in 2013 Michael Kitces and Wade Pfau released an article showing that many most likely overstated the importance single premium immediate annuities (SPIA) played in retirement income creation and showed that other investment options were equal or possibly superior to SPIA's. Some took that research and declared it proof that annuities were a waste of time and money. I don't get that same sentiment from Kitces and Pfau when reading the paper, but they do show data that supports a position supporting avoiding annuities because you could potentially do better with other investment options. There's just one problem with any suggestion that one ditch the annuity in favor of the alternatives…none of the alternatives can deliver the same guaranteed income with automation that an annuity does. The complexity of managing your own assets for income production isn't a task that I personally find all that daunting. I'm sure there are others out there who fall in the same camp. But I can assure you after years of experience talking to people from all sorts of backgrounds that I am in the minority. The same goes for those who, like me, don't find the task of managing assets for income terrifying. The technical expertise needed to manage your own assets to produce income is intermediate to advanced in the world of finance. Managing the process with discipline is an entirely other (but important) discussion. But aren't there financial advisors who can take care of that for me? This is a reasonable question. It's actually an angle some financial advisors might take in an attempt to woo you into handing all of your investable money over to him or her. There was even a time I myself might have attempted to do this very thing when I held an investment license. But understanding the world of personal finance as I now do, I find the prospects of managing assets for the purpose of income generation through financial products like stocks, bonds, or funds (mutual funds, ETF's, etc.) for a host of clients most likely unmanageable for the majority of financial advisors. For this reason, a lot of them default to automation products like annuities when the time comes for a client to begin producing retirement income. I'm speculating on this so I might be off plus or minus a bit, but I'd estimate that in order to have a financial advisor truly manage your assets to produce income specifically for your need you'd likely need something like $10 million in investable assets and be one of 15 maybe 20 clients of that advisor. All of those other clients would need to be in similar asset size in terms of investable assets to you. In that situation, I could see an advisor having enough money under management with few enough clients to have the time to dedicate to the task of customized income creation. This profile is representative of a minuscule fraction of the population. So for most people managing assets to produce income and trying to beat what an annuity can do requires a lot of personal legwork. For some, this is completely doable. But for a lot of people, it's a nonstarter. Despite what the investment industry would have you believe people find many of the features offered by annuities attractive. In a recent survey conducted by Jackson National Life and the Insured Retirement Institute, over 85% of all respondents identified “Lifetime Income” as something in which they were either somewhat or very interested. The investment industry spends a lot of time and money marketing against annuities because it understands that annuities provide features it cannot. Ken Fischer, the self-proclaimed hater of annuities understands this very same principle. Ken spends lots of money and time beating the war drum of fees against annuities and pointing out examples of misapplication of the product. What he fails to mention is that if he wants to provide clients with guaranteed lifetime income sources, he'll have no choice but to recommend they buy the very thing he purports to hate. Additionally, the sales data doesn't lie. According to WINK, non-variable annuities sales in Q4 2018 were up 54% over Q4 2017. Sales of these annuities in this time period totaled $33 billion. That's $33 billion going into newly issued fixed annuity contracts from October 1st to December 31st. There are several industries in the United States that don't see that sort of money change hands in an entire year say nothing about three months. I'm not one for small talk with strangers. If I'm sitting next to you on an airplane, we aren't likely going to get off the plane as new best friends. I'm pretty upfront about being a life insurance salesman, and I learned years ago that it was a great tool for ending a conversation with someone–I use it regularly in social settings. But on occasion, some highly talkative and friendly people will press on. Perhaps its because they've sized me up and determined I'm not likely to suddenly turn into Ned Ryerson. Or they have some weird interest in insurance. In either case, I find myself at times discussing insurance (of all things) with complete strangers and one topic that often comes up in a very favorable context is annuities. People will ask if I do annuities. I tell them I do, but not often (total truth). They will then go on to tell me how they either have (or knew someone who had) and how awesome it is or how they've done a little research on annuities and love the idea. Personally, I have a very fond opinion of annuities. I don't sell a lot of annuities each year, but I suppose building a web site dedicated to how people use permanent life insurance rules out a lot of the potential annuity buyers. I also think that attacking annuities and suggesting that people could do better without them is a great disservice to a lot of people. I have no problem with someone who wants to pursue their own income producing strategy outside of annuities, but I've also learned that very few people will take on the roles and responsibilities necessary to accomplish this task. This leaves a lot of people in a precarious position as the retirement years go by. I've even witnessed some of the most financially shrewd suffer financial instability due almost entirely to an unwillingness to adopt all the disciplines necessary to truly manage assets for retirement income. Annuities provide an incredible thing. They transform assets into guaranteed automatic income. Sure they have fees. No one is going to make such an offer without a clear path to profits in providing such a service. Such a service is gravely needed and highly desired among a huge majority of Americans. And it's for this reason that annuity buyers will always exist no matter how much detractors argue against them.